Ten years ago, writer/director Nacho Vigalondo made his feature debut with Timecrimes, a wonderfully ironic and wacked-out bit of time travel head gaming. Nacho is back with Colossal, bringing irony that’s a little sharper, comedy that’s a good bit darker…and a great big scary monster. Anne Hathaway is fantastic as Gloria, a frequently drunk party girl in New York who loses her job, doesn’t get the wake up call and does gets the boot from her live-in boyfriend. Moving back to her hometown, she reconnects with Oscar (a solid Jason Sudeikis), a childhood friend who happens to own a bar where Gloria is welcome to work part-time. Wait a minute – what’s this in the headlines? A giant monster has appeared in downtown Seoul, Korea, and after watching all the viral videos of the beast in action, Gloria realizes that she alone is controlling its carnage or, in some cases, its awkward dance moves. 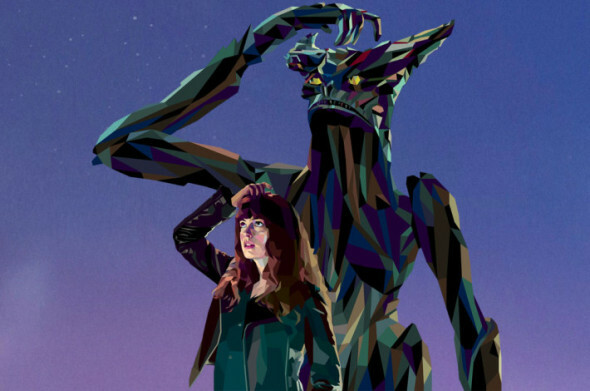 Colossal could also describe the height of Vigalondo’s latest concept, but despite some shaky interludes, it’s one worth the investment. Hathaway and Sudeikis make a compelling pair, and as secrets of the monster’s history are revealed, Vigalondo lands some solid satirical blows about self-absorption and personal demons. Perhaps best of all is how Colossal works out of the conceptual corner it backs into. Much like the Koreans who keep coming downtown no matter how often the monster appears, Vigalondo is committed to the end, delivering a strange but satisfying in-the-moment fable.